On February 2012, French company PIRS SAS was selected to build a new fertilizer terminal in the Port of Riga in Latvia for the company RFT. The project had initially started with another dome company, but there were safety issues and PIRS was called in as a replacement. Several factors were taken into account, including environment, safety, efficiency, cost and quality. However, it was cost and quality that were the overriding reasons for the choice to use a dome, instead of more conventional storage systems. A further consideration was time pressure — it was vital to build the terminal in the shortest possible timeframe. The project aim was to build the most advanced and safest fertilizer terminal in northern Europe. When finished, this terminal will handle more than 2mt (million tonnes) of fertilizer per year. PIRS SAS was contracted to design and build six domes, to store different types of fertilizer, with a total storage capacity of 130,000 metric tonnes. Local partners were used to deal with the rest of the work. The project includes the construction of four hemispherical domes, with a unit capacity of 25,000 metric tonnes, and two hemispherical domes with unit capacities of 15,000 metric tonnes. The 25,000-tonne domes have a diameter of 51.8m, and are 25.9m high. The 15,000-tonne domes have a diameter of 41.2m, with a height of 20.6m. Fertilizer is reclaimed from the dome by gravity, through hoppers located in a diametric gallery crossing under the six domes. larger domes by 487 piles (diameter 820mm). A large access door, 5.5m and 5m high, with a tunnel allows access by front- wheel loaders if necessary. domes). The dome structures were designed to support very high loads on top, mainly because of the three-conveyor decks on each dome. The vertical loads on the top apex are 380 tonnes, with horizontal loads of 124 tonnes. 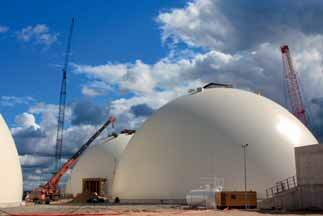 The domes will be used to store different fertilizers, which will arrive by wagon and be loaded into the dome. From the dome, the product will be loaded into vessels. The main fertilizers are UREA, CAN-AN, DAP 1 and DAP 2. PIRS has already shown that, even under difficult conditions, it is able to find the right solution for a project and can come up with the optimum solution. The company is constantly improving technologically and in terms of quality, and always strives to keep its prices as low as possible. It remains confident that it can solve all bulk storage issues.